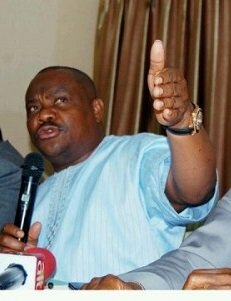 The Supervising Minister of Education, Chief Nyesom Wike , said on Monday that the Federal Government would invest N1.3tr in university education over the next six years. Wike made the statement when a team from the World Bank and the African Centres of Excellence paid him a courtesy call in Abuja. He said the Federal Government was making huge investments in research, infrastructure and improvement of quality teaching in the university system. Wike said this was because the government realised the potential that could be harnessed in an effective university system. He said the allocation of 10 slots out of 18 ACEs to Nigeria by the World Bank was a proof that such investment was beginning to yield dividends. The minister said it was the duty of Nigerians to ensure that they played their own part by contributing to the development of the sector. He said Nigerians should also shun all vices that often portrayed the country in negative light. The minister assured the World Bank that the $80m grant to the ACEs would be judiciously applied to achieve the goals for which the centres were established. He commended the leadership of the National Universities Commission for achieving such a feat and expressed the belief that it had the capacity to supervise and monitor the implementation of the funds. The Vice-Chancellor of the University of Jos, Prof. Hayward Mafuyai, on behalf of his colleagues, gave an assurance that the ACEs would be made into models the world would copy.